Students who qualify could earn an undergraduate degree in marine affairs and a law degree in six years instead of the standard seven. BIDDEFORD — The University of New England and the University of Maine School of Law are partnering on a program that will benefit students who want to pursue a career in maritime law. Qualifying students could earn an undergraduate degree in marine affairs and a law degree in six years instead of the standard seven, saving students both time and money, UNE President James Herbert said in announcing the program Wednesday at the Arthur P. Girard Marine Science Center at the school’s campus in Biddeford. “We have two real gems right here in southern Maine and we’re going to put them together for this accelerated program. It’s very exciting,” said Herbert. There are many schools across the nation like UNE that have undergraduate marine science programs, but UNE is one of only four with undergraduate marine affairs programs, and the Maine School of Law is one of only six in the country with a specialized program in marine law, Herbert said. Jeanne Hey, dean of the college of arts and sciences at UNE, said the marine affairs degree is an ideal start to a legal career, as the program covers marine law, policy and trends as well as impacts on the environment and institutions that oversee coastal and marine systems. Herbert said the school has responded to Maine’s presence in the marine economy by furthering the breadth of its marine programs. 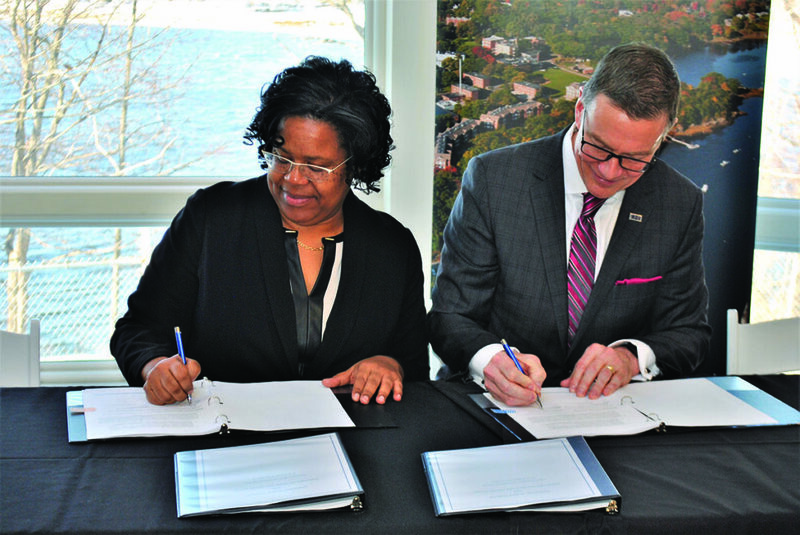 Danielle Conway, dean of the University of Maine School of Law, said the partnership will help establish the two schools as leaders in marine affairs. “No one can do it like we can do it,” she said. Herbert believes the new matriculation agreement will attract students from Maine and beyond, and the schools will make it a goal to attract as many students as possible into staying in Maine after graduation.